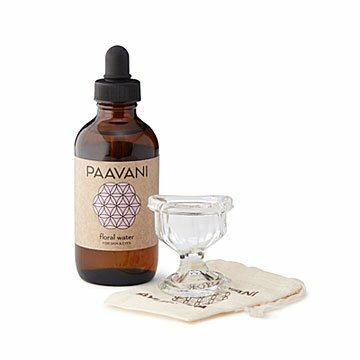 An ancient Ayurvedic ritual is reimagined with this unique, beginner-friendly kit. It all starts with this reimagined ancient ritual: eye washing. For thousands of years, people have been cleansing their peepers to keep them clear and bright. Curious? This kit makes it super easy for beginners. Pour a bit of the rose and lavender solution in the glass, press it to your eye, and tilt your head back. Roll your eyeball around and blink a bit (about 20 seconds). Then, repeat on the other side. A great way to deepen your Ayurvedic practice, think of the kit as the neti pot's lesser known sister. Handmade by a team in Nevada City, California. We recommend using our products within 6 months to a year of purchase. This ensures that the herbs will have the most beneficial action for your skin, body and mind. To maintain the shelf life of our products we advise our customers to avoid allowing moisture into any of the containers. Store in a cool, dry place away from sunlight and moisture.